It has been awhile since I've taken the time (not that much time is required) to read any of Montgomery's short stories and so I thought I'd start with some to kick off my reading this month. I picked Akin to Anne: Tales of Other Orphans randomly. What might be just as curious as Montgomery's short stories is how they came to light and were published as collections in the first place. Rea Wilmshurst (1941-1986) had some incredible fortune to be able to root around in the attic of Montgomery's birth home back in 1977. Her hunt produced twelve scrapbooks in which Montgomery herself had pasted her short stories that had appeared in magazines and periodicals. These short stories had never before appeared in book form and had never been part of any type of collection of stories. Wilmsburst began the work of editing the stories and compiling them into collections. One of the collections is Akin to Anne . This particular title boasts 19 different short stories, each featuring a main character who is orphaned and alone in the world. As is the case for all of Montgomery's stories, each has a happy ending and no one person is left lonely. If you are looking for a quick, happy read well, you might consider this one as it is easy to read in increments. As you are likely very aware, Montgomery herself was a very lonely individual. Montgomery's mother died when she (LMM) was just shy of two years old. Her father was so grief stricken that he apparently couldn't think of raising a daughter and placed Lucy in the home of her maternal grandparents. Although Montgomery was well-cared for in the sense of having a roof over her head, clothes to wear, and people to tend to her, she never felt loved and being loved was what she wanted more than anything else in the world. 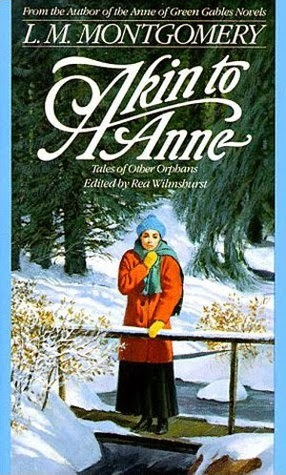 I think one of the reasons that Anne is so popular is that Montgomery wrote from personal experiences and emotions which worked to bring Anne - as well as these orphaned characters in this collection - to life. She knew the pain of loneliness and was therefore well equipped to write about it in a way that tugs at the reader's heart strings. The stories in Akin to Anne were, as I said, published in magazines and periodicals. They appeared in publication between the years 1900 and 1933. You can tell as you are reading them that the publishers of these short works were looking for stores that communicated a moral truth. Most of the stories focus on the concept of extending kindnesses or the beauty of self-sacrificial love. You can especially see that this is the case if you sit and read all nineteen stories in one fell swoop! "No - no, I haven't anybody in the world. That is why I hate vacation, that is why I've hated to hear you and the others discussing your vacation plans. you all have somebody to go to. It has just filled me up with hatred of my life." Miss Channing swallowed her honest horror at such a stand of felling. "Constance, tell me about yourself. I've often wanted to ask you, but I was always afraid to. You seem so reserved and - and, as if you didn't want to be asked about yourself." Sound at all familiar? Katherine with a 'K'? These stories are definitely worth reading, even if bits and pieces of them sound a bit familiar. It is a very curious exercise to see how Montgomery developed as a writer if nothing else. For a cozy quick read this cold January, you might want to consider some happy short stories by Montgomery. I'm glad to have made some time to visit with them again. I am reading Anne of Windy Poplars this month and I have been enjoying it as much as the first three in the series. Knowing a little more about LMM the stories feel so much more personal. Thanks for sharing that history and for introducing me to LMM in the first place. That one except did sound very much like Katherine with a K! I have never read any of LMM's short stories. A quick look on Amazon and it appears this one is out of print. Is anyone aware if it available in e-book/kindle anywhere?